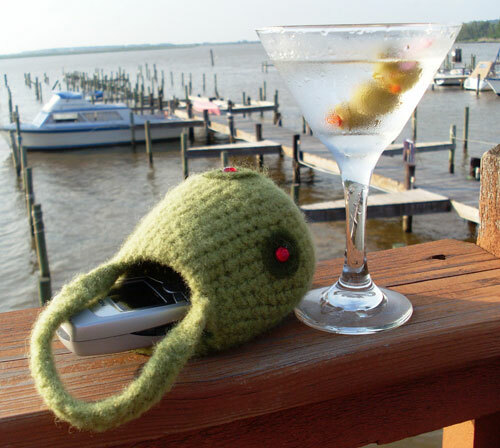 Take along the essentials in this tiny, hands-free cocktail purse. Designed to be worn around the wrist, you don’t have to worry about leaving it behind or dropping it into the water as you climb aboard your boat for sunset and cocktails, with friends at the marina. 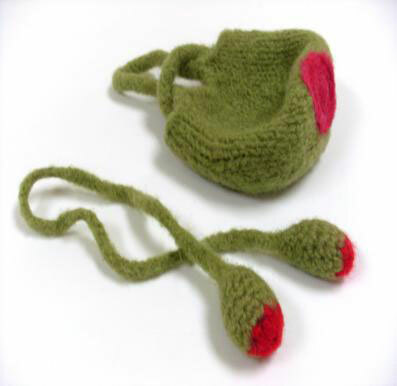 This purse is worked in felt-able wool and felted in the washing machine. The design embellishments are applied using needle felting but could be embroidered or appliquéd with thread. For a more festive look, make the olive designs with sequin strands. Size varies depending upon yarn used & number of felting cycles. Model is 5 inches x 12 ½ inches around, not including handle. US I/9 (5.5 mm) or size needed to obtain gauge. Purse is worked in un-joined spirals, with yarn held doubled throughout. 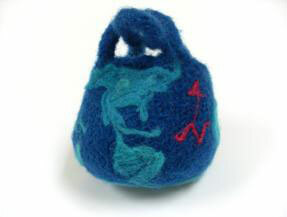 Exact gauge is not terribly important as the purse is felted. However, it is important that you make sure to block the opening large enough to fit your hand inside. Purse may need to be felted several times to ensure the desired results, i.e., size & texture. 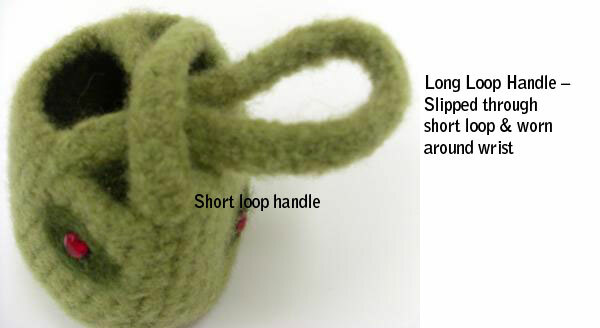 The purse is secured by slipping the longer loop (handle) through the shorter loop (handle) and then slipped over the wrist. Sc 6 sts in adjustable loop. Chain 10, do not fasten off. Continue with handle below. Continuing with the chain 10 from previous step, skip 9 sts across top of purse, sl st into the next 2 sts. Ch 2, turn, hdc across chain & sl st into st next to beg of chain. Finish off. Skip 5 sts from the last sl st of the previous handle, attach yarn to next st and ch 29. Row 2 Ch 2, turn, dc across chain and sl st into st next to beg of chain. Fasten off. Weave in all ends. Felt the purse by washing in hot water and rinsing in cold. Include detergent and a couple of towels to the felting wash. Warning: Do not use light colored towels with dark colored yarns as they may add unwanted lint to your project. Check progress frequently. Purse may need additional washes to achieve desired results. When felting is complete, check purse opening and handle size. These parts can be stretched a little, while drying, if the opening is too tight for your hand to reach into the purse and/or if the purse handle cannot slip over your hand. In order to obtain a rounded shape, block the piece by inflating a balloon inside of the purse. 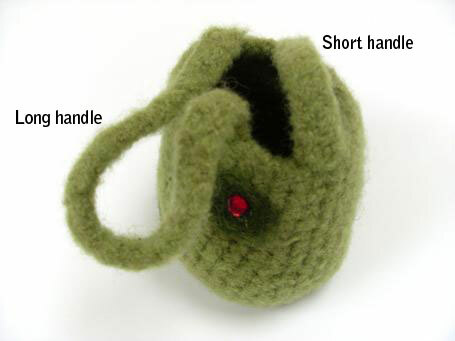 Manipulate the purse, by pulling the piece into shape, to ensure an oval shape for the olive purse or a more spherical shape if making the earth version. Let dry before removing the balloon. Embellishments – Models are embellished by various means. 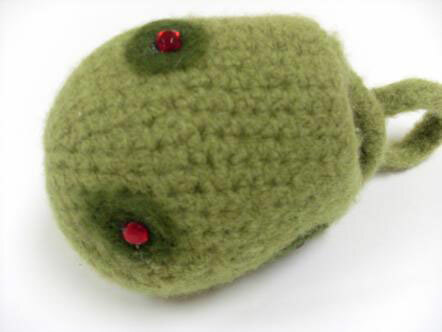 The main original olive design is needle felted onto machine felted & blocked purse. Please see below for basic instructions for needle felting as well as other suggestions. Models are embellished by various means. 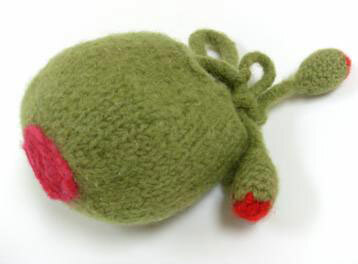 The main original olive design is needle felted onto the machine felted and blocked purse. Please see below for basic instructions for needle felting as well as other suggestions. Refer to the notions listing above for the materials and tools needed. Notes The needles are tiny and sharp, please be careful! Additionally, make certain the foam is thick enough sothat you don’t damage the table or needles when you start the process. Working on a sturdy table, place the thick foam inside of the purse. Smooth the design area across the foam. Take green roving and pull a small amount from the clump. 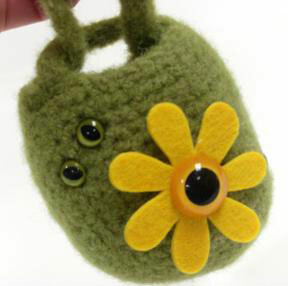 Lay the green in an oval shape directly onto the purse, making sure to tuck in ends. Begin needle felting using a needle felting tool. Continue adding roving, filling in “bald spots,” as needed. Using a small pinch of red, repeat the process for the pimento. Place olives in a random pattern over entire purse. 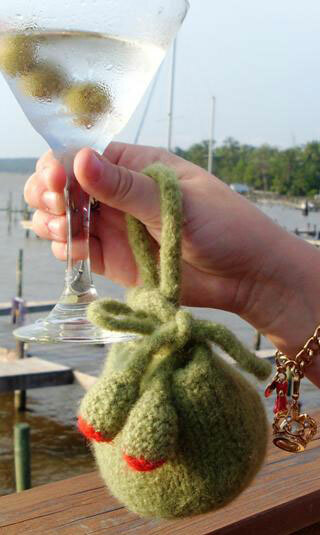 Make purse into one giant olive by needle felting a large red circle on the very bottom of the purse. 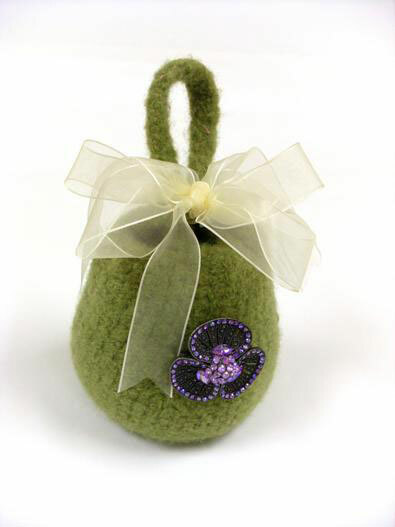 Glam it up – glue sequins or plastic crystals onto the felted olive for a sparkly look. Need MORE glam? – make entire olives out of sequins by gluing strands of green sequins in an oval design. Finish off with a pretty crystal pimentos. Need a feminine bag to take to a wedding, prom, or tea? Pin on your grandmother’s broach and tie a pretty bow onto the short loop handle. Or, instead of the broach, why not hang a charm or a bead or satin tassel, just underneath the bow for a bit of sparkle? Strap Ch 71, working in back bumps of each sc, sc in 2nd ch from hook and in each sc across, sl st into previously made olive and fasten off. Second olive Make a second olive, minus the chain, and attach to the other end of the strap. Weave in all ends & felt in washer as desired. Don’t forget to have your continents oriented to the north! Needle felting the world is more time-consuming than it is hard & needle felting is forgiving as you can pull the roving out if you don’t like the results. 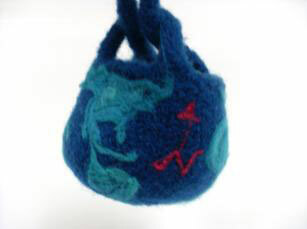 I felted mine free-hand but if you want to be more precise planning your globe, try sketching the continents with a piece of chalk onto the bag first. Finally, this is a small bag & the earth design is more or less impressionistic, rather than realistic so don’t sweat the process, enjoy it! Or just use your imagination?